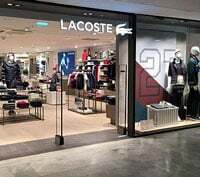 Fibers, including cotton used in LACOSTE polos, must adhere to high standards of quality and must also register in accordance with the principles of sustainable development. LACOSTE ensures used cotton did not come from sources at risk in terms of respect for human rights. In this way, LACOSTE supports RESPONSIBLE SOURCING NETWORK and the COTTON PLEDGE CAMPAIGN fighting against forced labor and child labor in cotton fields. With more than 1,200 points of sale around the world, LACOSTE pays special attention to the energy consumption of its stores. On this ground, the brand has opted to work on the integration of environmental criteria in its store concept. These studies relied particularly on the implementation of the LCA (life-cycle assessment), focusing primarily on lights and air conditioning. The Lacoste Foundation develops tennis and golf programs within educational projects for the youth in poverty.